"And hence it was, as they say, men at first became sensible and human, having once tasted of the harvest, and being all accustomed by hunting and following the chase not only to behold with respect, the wounds and blood of the wild beast, but to rejoice at their being killed and eaten....This gave them strength and vigor,,,,,,,,,,,"
Welcome to Mann Over Bored Charters! Inside you will find a listing of many different boats for charter. Each boat has it's own characteristics and capabilities to choose from. We endeavor to provide you with a tailored opportunity for whatever type of trip you're searching for. Whether it be a family trip, corporate group, bachelor/bachelorette party, or private offshore multi-day trip. Shorter trips or longer, we can make it happen for you. Take a look and see if anything strikes your fancy, give us a call and we can work out the details for you. Our philosophy is that, everyone who gets on one of our boats is either taking their first trip, their last trip or the only trip they will ever take in their lifetime. We don't want to make it a bad one. We want it to be something positive to talk about forever. Safe and fun, that's our standards here at M.O.B Charters. Thank you for visiting us and we hope to hear from you soon! Located in Destin, Florida between Pensacola and Panama City Beach, we are known as "The Luckiest Fishing Village in the World". 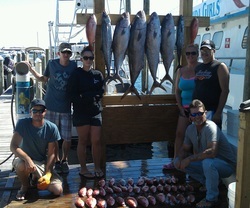 We specialize in offshore fishing, nearshore fishing and trolling trips for the whole family. Everything is included in your trip, except your food and drink. All fish cleaning is done free of any additional costs and your mate greatly appreciates your gratuity. He works hard for it! We love what we do. Welcome to my life. I want to share it with you too. I have been fishing since I was 19 years old and I have the experience to put you in a position to see and do what I have done most of my life. If you want the fishing experience of a lifetime, you have come to the right place. I have opportunities for you to book a trolling trip or fish on the bottom for whatever species you prefer. I can put you on Kings, Spanish, Wahoo, Marlin, Shark, Grouper, Snapper and when they are here, some of the most exciting Cobia fishing in the world. Whatever lives in the Gulf, I can put you on them. Take a look around and get familiar with what I have to offer. Please include the kids. They are welcome and encouraged to come. Mann Over Bored Charters and Guide Services. Our whole compliment of Captains and crew hold qualifications and licenses required by the USCG, and hold your safety as the utmost importance on your trips. Our services include some of the best fishing opportunities in the country. Browse through my site here and see if anything catches your eye. Don't forget the kids. Some of the reviews we get for our location on Destin Harbor. Come sea us today!